Stay in touch with the campaign. Seven Sundays is a Voyageur sponsor of Pedal to DC. Seven Sundays all started because of a honeymoon to New Zealand. It may have been predestined, but it was here over the course of this month long trip of backpacking and camping where we found ourselves, fell in love with nature, and discovered muesli. Within a 6 months, we were in a Uhaul headed back to Minnesota from our fast paced New York City life. In the Summer of 2011, we sold our first bag of Seven Sundays in the Midtown Farmers Market in Minneapolis. At the same time, we were starting a family. Admittedly, the balance of starting a food business and raising kids has been challenging at times. It has afforded us flexibility, though, and we have always prioritized carving out time to disconnect and "just be" in nature. In our humble opinion, there is no better place in the world (outside of New Zealand perhaps) to disconnect than the Boundary Waters. We have taken many trips over the last 7 years, from week long adventures with no kids covering lots of water and portages, to a short and sweet 36 hour stint with our 2 boys (including a potty training toddler) this summer. Every moment of packing, portaging and paddling has been worth the effort. Likewise, every dollar we have donated to Save the BWCA as a family and as a business has been worth it. We are so thankful for people like Dave & Amy Freeman who are working hard and speaking loudly for this quiet place. The least we can do is provide them with a little nourishment along their journey. Seven Sundays was an extremely valuable source of support and of sustenance to the Freemans on their bike tour across the Eastern United States to spread the word about the Boundary Waters. You can read more about Seven Sundays and their mission to “flip the breakfast aisle on it’s head” on their website. We are grateful for the support of Seven Sundays. We got really, really lucky one day in the spring of 1975. Nancy and I were hanging out in the Zoology Department at The University of New Hampshire as technicians and grad students when our major professor, Dr. Jim Haney, asked if anyone might want to work with zooplankton in Ely, Minnesota. Hell yeah, we both said, but the job was just for one person. With two volunteers, Dr. Haney called the EPA in Ely and made it clear that the work they needed done would require two people. Voila! We both had a job for the summer as contractors with the US EPA in where? Ely, Minnesota? Where the heck is Ely and what were we in for? The rest is really one very long history but it still in many ways feels like the summer of 75 to Nancy and me. We did our jobs for EPA, came back in 76, got other jobs with the DNR and taught biology at Vermilion Community College. That all ended abruptly and we got into business and founded our company in 1979. We never looked back really. With degrees and some life experiences we found Ely to be home. It seemed right. We were in love with each other and the Boundary Waters and we couldn't imagine going anywhere else. Now, some 40 years later we're still happy and we have carved a niche that we're really pretty proud of. In our tenure up north in Ely we've seen the Boundary Waters get more protection as a wilderness in 1978 and we've seen threats appear to the wilderness. The biggest threat that has lingered for a long time resurfaced in the last 10 years when the price of copper rose to record levels and mining companies became interested again in the ore deep in the crust just outside the Boundary Waters. This time the threat was real and imminent. As biologists we understood the threat to the water from acid runoff of copper mines. The sulfide ores around world are all dangerous to the watersheds and they always pollute wherever they are mined. Nancy and I had to act to stop any mine near the wilderness waters of the BWCAW. Our little business, Piragis Northwoods Co. lead by two nature freaks from the east managed to prosper with a lot of hard work, great employees and a little luck. We've grown slowly and steadily and sustainably since 1979 to the point today where we employ over 50 people in summer and 20 year round. Our concern for the Boundary Waters has not waned over these years. The wilderness is what Ely is all about. It brings us business, pays our salaries and support all the families we employ. We love the wilderness just for its purity and its ability to bring us back to reality whenever we travel by canoe, ski or snowshoe. The lakes and streams here are vulnerable to acid pollution. The wilderness experience we and thousands of others seek could so easily be lost. Our work to stop copper mining in our watershed is because we love this wilderness and all it means to us. It's also because we love our business, our customers and all our dedicated employees. It's important that this threat never materializes and displaces all of us in this sustainable world with a boom and bust town and a dead watershed. So life is good yet today in our end-of-the-road town. We still paddle, hike, ski, and enjoy every season. We have traveled the world since 1979 and have seen great wilderness areas and wild coastlines kayaking from Greenland to Chile to Vietnam. Nancy and I still find the Boundary Waters to be the wild country we love best. There's nothing like the call of the loon on a clear wilderness lake far from the maddening crowds of normal life. It focuses our attention on the present and why we work to protect it. I have hope for the future of our business and our great wilderness if we can weather the current storm and put to rest all the claims to riches that lie beneath it today, safe and deep in the earth's crust. Steve and Nancy Piragis founded Piragis Northwoods in 1979, and their doors are open from 6 a.m. to 8 p.m., so be sure to stop by and say hello on your next Boundary Waters trip. We are grateful for the support of Piragis Northwoods. Building canoes is a craft, and Ted Bell, founder of Northstar Canoes, is one of the best. A former flatwater and downwater canoe champion, Bell has an eye for what paddlers need and has been building canoes for nearly 40 years. Northstar Canoes are often seen cruising toward campsites in the Boundary Waters. With that dedication to creating fine canoes, comes an appreciation for Wilderness. Northstar places value on protecting the Boundary Waters for its paddlers and future generations. “It'd be dumb not to support an unparalleled wilderness area,” says General Manager, Bear Paulsen. For the last two years, Northstar has teamed up with Rutabaga Paddlesports at the annual Canoecopia event in Madison to give back to the Campaign to Save the Boundary Waters. A portion of the proceeds from all their canoes sold goes towards protecting the Boundary Waters. Northstar has also donated gear to many of our events. We’re grateful for the support of Northstar Canoes. One of the things I enjoy most about living in northern Minnesota is the constant change seasons. The longer days and brilliant wild flowers of spring, boating and fishing in the summer, fall colors and hunting in the fall, and last but not least, winter—my favorite season of all. 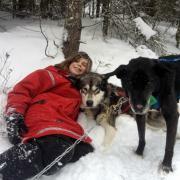 For me, winter and dogsledding go hand in hand, and most winters Amy and I live and work at Wintergreen Dogsled Lodge on White Iron Lake. Shortly after paddling into Washington D.C. on December 2 after our Paddle to DC adventure, Amy and I were back in Ely prepping dog sleds, helping to train and care for 69 sled dogs, and leading our first dogsled trip of the season. The trips typically last four or five days and each week we get to meet people from different parts of the country—even far corners of the world. 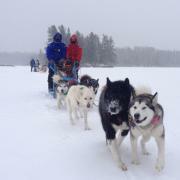 They come here to experience the wild beauty of the Boundary Waters Canoe Area Wilderness and the Superior National Forest, and learn to dogsled. Most the groups are all adults or families, but our last trip was with 16 seventh and eighth grade students and their two teachers from Illinois. They were here for seven nights and we spent three nights camping out on a remote lake called Crockett. 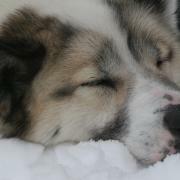 I love working with young people because, like the sled dogs, they are full of energy and excitement. With a little guidance and encouragement they will jump into most any task, from collecting firewood and cutting it into pieces to feeding the camp fire, chopping a hole through several feet of ice to gather water, or caring for and working with the dogs. Our second night at Crockett Lake was clear and cold. After dinner we left the warmth of the fire and walked through the cold night air onto the frozen lake. The moon would not rise through the scraggly spruce trees across the lake for another hour and the Milky Way shimmered overhead. I helped the kids find the North Star and pointed out a few of the constellations, which we take for granted, but are hard to see from their urban backyards. More than anything they were taken back by the silence. When they finally quieted down, which a group of kids that age rarely do, there was total silence, no cars, no wind, nothing but the sound of the cold snow shifting under people’s feet as they shifted their weight from side to side to try and stay warm. The silence was broken by the faint call of wolves in the distance, which elicited a chorus of howls from the 22 sled dogs bedded down back at our campsite. We returned to the warmth of the campfire to fill everyone’s water bottles with boiling water and have a snack before bed. Then each kid ran back into the cold to stick the water bottle into his or her sleeping bag to help warm it up before climbing in for the night. As I headed off to bed I wondered how everyone would sleep. Surely some would sleep well and others would wake up several times and have trouble sleeping, but regardless, they were making memories that will stay with them for a long time. Helping people experience dogsledding, sleeping on a frozen lake, the silence and beauty of this place, and the skills and confidence gained through wilderness travel reminds me why the Boundary Waters is so special. This thought helps me focus my efforts to help protect the Boundary Waters for future generations. 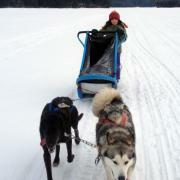 Amy and I will continue to introduce people to the joys of dogsledding and the winter woods for a few more months, but we are also continuing our work with the Campaign to Save the Boundary Waters to educate people about the threats that mining in a sulfide ore body bring to this region. Last Saturday I gave a presentation about Paddle to DC at the REI in Bloomington, Minnesota, that was hosted by the Minnesota Canoe Association. Save the Boundary Waters Volunteers Ann Cosgrove and Margot Monson were there with a table full of information to share with people—thank you Ann and Margot! On March 14, Amy and I will be speaking at Canoecopia, which is the world’s largest paddle sports expo, in Madison, Wisconsin, and we will be volunteering at the Save the Boundary Waters booth throughout the weekend. Plus, we will be speaking at the Midwest Mountaineering Outdoor Adventure Expo in Minneapolis the weekend of April 24-26. We are also planning events at the Patagonia stores in Chicago and St. Paul in April. I hope you can join us at one of these events—and bring a friend or two with you! Dave Freeman and Amy Freeman were named National Geographic's 2014 Adventurers of the Year. They lead educational adventures through Wilderness Classroom. Paddle to DC, their 2,000-mile, 101-day paddle (and sail) from Ely to Washington, D.C., last year supported the Campaign to Save the Boundary Waters. Here is what you have all been waiting for. The REAL story from the support crew. Your exclusive behind-the-scenes look at the Paddle to DC. As the Paddle to DC support team, I traveled with Dave and Amy for the past 100 days. My journey was more like a road trip. A road trip at the pace of a canoe. We passed through wilderness, rural towns, forests, mountain ranges, and beautiful cities. In the context of my road trip, these big cities provided welcome energy and fun. They were the next destination in my mind. The Paddle to DC was, in this same way, a unique and difficult canoe trip. The cities were a bit of an interruption to the trip, both logistically, and mentally. Don't even get me started on the driving. This was my office for a week in Fort Coulonge, Quebec. A small historic town on the edge of the Ontario /Quebec border. Because I was working on setting up events in Ottawa for the next week, this phone booth made a convenient office. 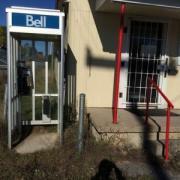 Luckily, public telephones are easy to come by in Canada. Since being back in the United States, I have not found a singe one in operation. Dave and Amy did 40 presentations in 100 days. Think about that for a moment. They paddled nearly every single day for 100 days and managed to spend nearly half of their time sharing their journey with others. A large part of my work throughout the journey was transportation to and from these events or organizing the events themselves. Thank you to all of our amazing partners that allowed Dave and Amy to speak to their circles. It is truly amazing to see so many people working to protect their water, get people outside, and defend our environment. I am especially grateful for the students that reached out to us by asking Dave and Amy to speak at their school, writing about the trip, and sharing it with their friends. I know far too well how easy it is to put the blinders on when you are in school and work on what is in front of you. As I think about going back to a University soon, I now have so many examples of how to stay involved in current issues and be a leader. All of you still reading are waiting for the juicy gossipizzle of working with Dave and Amy. The shocking truth is that they are the most humble, genuine, kind, and hardworking people I have ever met. Dave and Amy would paddle all day and manage to do as much communication as I did. They spoke to over 2,700 people over the course of the journey and even at the end of the day, never let them see how tired they were. But to truly see Amy and Dave in action, is to see them working with kids. We visited many schools over the 100 days where they spoke to loud, energetic school groups. It is amazing that they didn't lose their voice from trying to be heard over the rumble of middle schoolers in an assembly. The excitement of the kids is truly contagious. And there is no doubt that many of them will be our future adventurers thanks to Dave and Amy. It was an honor to work with them and be inspired by their true passion to protect wild places. On a rainy day in late August my wife Amy and I climbed into our canoe and paddled away from the Voyageur Outward Bound School in Northern Minnesota. About 50 people came out to paddle the first mile of the Kawishiwi River with us as we followed the path of pollution from the proposed Twin Metals mine into our nation's most popular wilderness, the Boundary Waters Canoe Area in Northern Minnesota. The goal of our journey was to celebrate the 50th anniversary of the Wilderness Act and rally support for the Boundary Waters to protect it from a series of proposed sulfide ore mines on the edge of the Boundary Waters. 101 days later many of the same Minnesotans huddled together in the freezing rain and climbed into canoes to paddle with us for the final stretch of our 2,000 mile journey by water from the Boundary Waters to Washington D.C. Our Wenonah Canoe, Sig, had gained several thousand signatures and a couple of scratches along the way. Through out the journey we did over 50 interviews with a wide range of local, regional and national media outlets, met directly with close to 3,000 people during 40 events along our route, portaged nearly 100 miles and dipped our paddles over 3 million times into dozens of waterways, from pristine Boundary Waters lakes to Superfund Sites along the East Coast. Several dozen people came out in the pouring rain to welcome us when we paddled into the Washington Canoe Club on December 2nd. We have compiled a few of our favorite images as well as a short video the distills Paddle to DC and the threats the Boundary Waters face into 8 minutes. 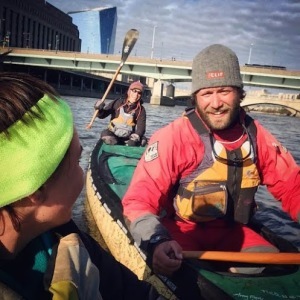 Paddle to DC: A Quest for Clean Water from Nate Ptacek on Vimeo. There were really 4 of us on this journey, Olivia Ridge (our project manager), Sig the canoe, Amy Freeman and me (Dave Freeman). We followed the path of pollution from the proposed Twin Metals Mines site on Birch Lake down the Kawishiwi River into the Boundary Waters and spent 8 days paddling through the Boundary Waters to reach Lake Superior at Grand Portage. 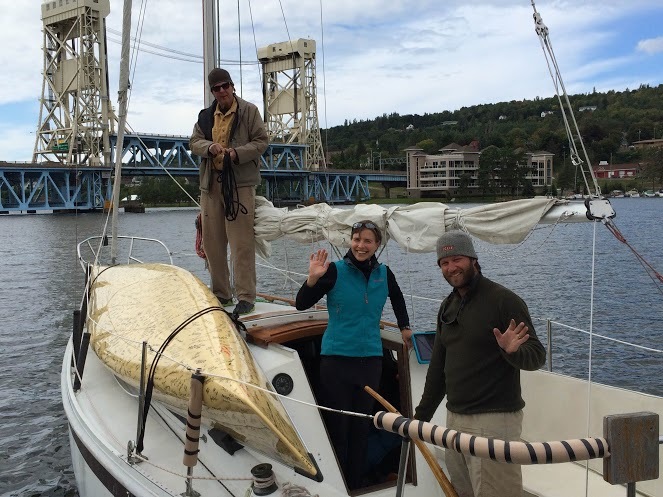 We spent 3 weeks sailing across Lake Superior and Georgian Bay, stopping in towns in Minnesota, Wisconsin, Michigan and Ontario to give presentations and share our story. Edward Abbey said,"The idea of wilderness needs no defense, it only needs defenders." Our goal was to gather more defenders for the Boundary Waters from communities in Northern Minnesota and across the country through events like this one at the Patagonia store in Washington D.C., media coverage, blogging and social media. During the first 80 days we camped most of the time. We usually found beautiful campsites along the waterways we traversed like this one on the French River in Ontario. We left our sailboat near the mouth of the French River in Georgian Bay. We would spend the last 2 months traveling about 1,300 miles by canoe. We encountered many beautiful places, like the Mattawa River in Ontario, but none were quite like the Boundary Waters, where we still dip our cups in the middle of the lake when we are thirsty. There was a lot of portaging, including 3 portages that were 15 to 30 miles long. We used our cart to traverse some pretty urban areas and connect an unusual network of waterways on our way to Washington D.C. The portaging gave us a chance to meet more people; lots of people stopped us ask what we were doing and many of them wanted to sign Sig and our petition to protect the Boundary Waters. As the weather got colder more people invited us to stay with them as we past through more urban areas between New York City and the Nation's capitol. Sig toured the Capitol and portaged past the White House. Chief Tidwell, the head of the US Forest Service, accepted Sig, our canoe, on behalf of the administration and the Sig is being displayed at the Forest Service Headquarters in DC so that more people will be able to learn about our journey and the Boundary Waters. 40 Minnesotans joined us in D.C. We spent 3 days meeting with elected officials and government agencies to educate them about the sulfide ore mines that are being proposed on the edge of the Boundary Waters and share our concerns. We have hung up our paddles for the moment, but our work to save the Boundary Waters from copper mines in a sulfide ore body has just begun. Please learn more about this important issue, sign the petition and join the movement. The Boundary Waters belongs to all of us and it is up to us to protect it. Dozens of people opened their homes to us, organized events and supported us physically and emotionally along the way. Hundreds more donated time and money through the Save the Boundary Waters Campaign to help make Paddle to DC a success. Thank you for all of your support. Paddles Up! Audubon Magazine hitched a ride with Dave and Amy Freeman as they cruised through New York City. Read the article, and then share it with friends and family members who might like to know. National Geographic's Adventure Blog has a lengthy interview with Dave and Amy Freeman about their recently completed 2,000 mile journey to Washington DC, the canoe that served as their petition, and what's at stake in the Boundary Waters. FOX 5 Interview 12.3 from Save The BWCA on Vimeo. 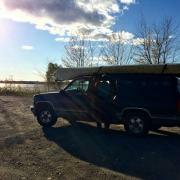 We portaged through DC to give Sig, our canoe, a tour. We have had many productive meetings and events and have many more scheduled today and tomorrow morning. It is really inspiring to be working with 40 other Minnesotans who flew to Washington DC and stand shoulder to shoulder with us as we work to protect the Boundary Waters from the sulfide ore mines that are being proposed on the edge of our nations most popular wilderness and celebrate the 50th anniversary of the Wilderness act and I sure that the Boundary Waters remains pristine for the next 50 years. Pleasesign the petition and join us in protecting this pristine Wilderness.